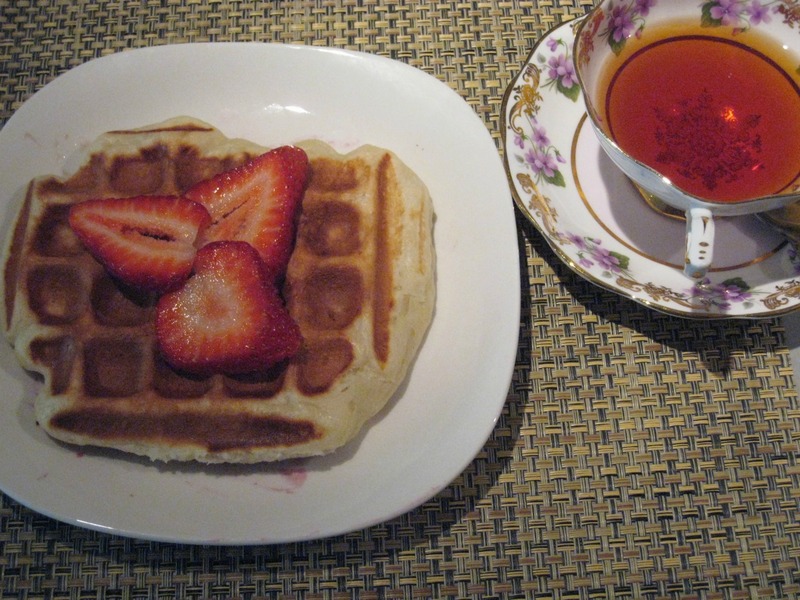 I’ve made lots of waffles before, but I wanted to try something new for a birthday brunch. I saw a few recipes online about yeast-raised waffles and figured I could try that out. I balked at the amount of butter the recipes called for, so I cut back on it a little. They are not difficult to make, but you need to plan ahead as you need to let the batter raise for about an hour before you want to use it. This recipe is huge – I think it made more than 15 waffles. I found this recipe on kitchen addiction. 1. Dissolve the yeast in 1/4 cup lukewarm milk and let sit for 10 minutes. To do this, just sprinkle the yeast on top of the warm milk; if it gets foamy you know it is working. 2. Whisk the melted and cooled butter with the 3 egg yolks and 1/4 cup lukewarm milk in a large bowl . 3. Whisk the yeast mixture into the butter mixture along with the sugar, salt and vanilla. 4. Next you need to add the flour, alternating with the remaining 2 & 1/2 cups of warm milk. Add half the flour, then half the milk, the remaining flour, and the last of the milk. 5. Beat the egg whites until soft peaks form, then fold into the batter. 6. Cover the bowl and put it in a warm place for about an hour, or until it has doubled in volume. 7. 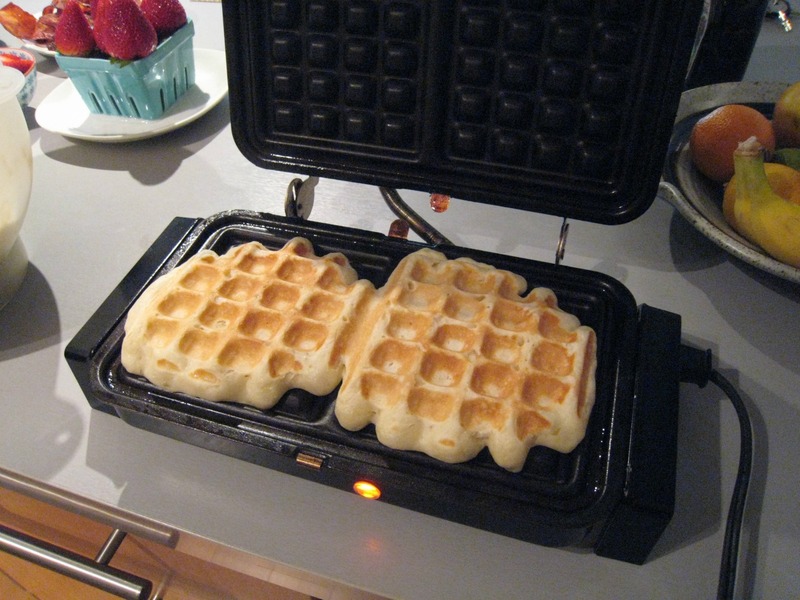 Preheat your waffle iron. 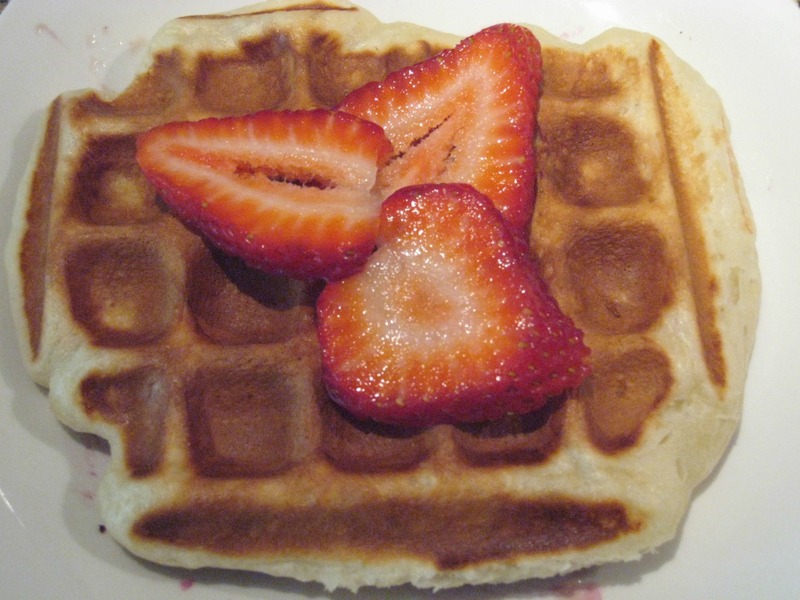 Give the batter a little stir to deflate it, then add about 1/2 cup batter to the waffle iron, or more or less depending on the size of your waffle iron. I know my waffles are almost done when I see steam escaping. 8. Top with maple syrup and any other toppings you like. I love some fresh fruit or a warm fruit sauce, and a dollop of yogurt. I cooked up all the batter, then put the leftovers in the freezer to pop into the toaster another day – soooo much better than eggo!